Very soon three of the most amazing, inspirational and wonderful people, are heading off on an incredible journey. I have been lucky to meet two out of these three bloggers and they are awesome. They are Sian from MummyTips, Josie at SleepisfortheWeak and Eva from Nixdminx . The three are heading to Bangladesh with Save the Children at the beginning of September after a representative from Save the Children saw Sian speak at CyberMummy. 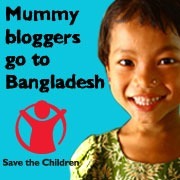 They will be raising awareness for mothers in Bangladesh and their daily struggles. Please, please sign the petition. It’s a Facebook app – so if you’re not on Facebook please sign up so that you can help. If you are a social media addict you can add the Twibbon to your Twitter avatar. You can add the Blogladesh support badge to your site. You will find the code here. So if you haven’t already, show your support by getting involved and raising awareness for this worthwhile cause. Nick Clegg is attending the UN summit in New York at the end of September and the aim is to present him with a 100,000 strong petition in support of the Millennium Development Goals (MDG’s) that were set by UN leaders ten years ago. The MDG’s are simple really, to reduce hunger, poverty and disease. We have till 2015 to meet these goals but in order to get there continued support from UN countries around the world is needed. Good luck Sian, Josie and Eve, hope you have a safe trip and pack lots and lots of tissues.